Coast Guard Commander Michael Antonellis of the Sector Delaware Bay Office of Prevention presented the crew of a Greek vessel a certificate of appreciation and an Automated Mutual-Assistance Vessel Rescue System ship&apos;s pennant for their role in the ocean rescue of four French nationals 1,582 miles east of San Juan, Puerto Rico. The crew of the Delta Kanaris rescued the French nationals from the Atlantic Ocean after their sailing vessel, the Recidive sank. The commercial vessel was diverted at the request of Coast Guard 5th District watchstanders in Portsmouth, Va. Using AMVER, the Coast Guard directed the Delta Kanaris to the location of the EPIRB, where they rescued the Recidive&apos;s crew before continuing on their route to Philadelphia. 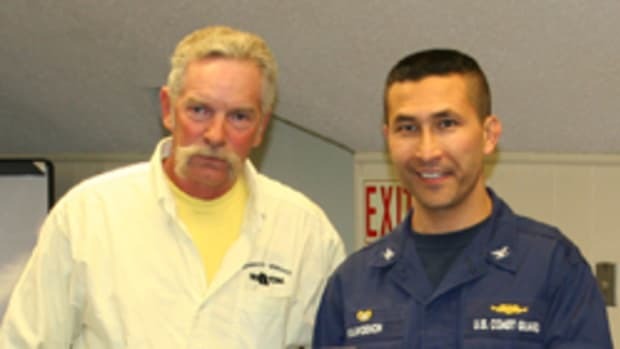 "This case is a demonstration of the continued tradition of mariners helping mariners at sea and ensuring that no call for help goes unanswered," said Beverly Howard, program analyst for AMVER Maritime Relations. The French nationals were sailing from the Canary Islands to Martinique on a trans-Atlantic voyage.